I really want In Time to be grrrrrreat! 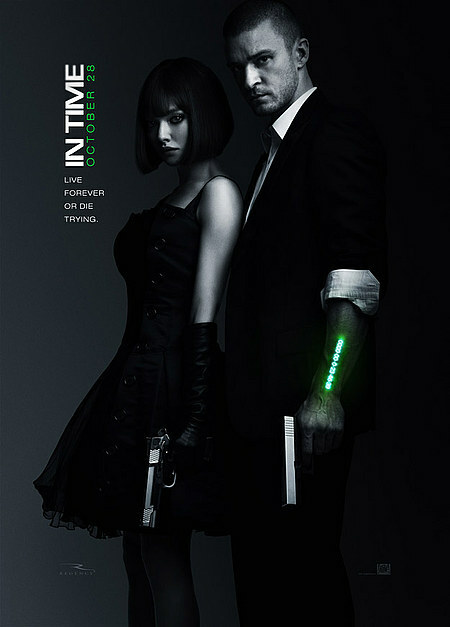 In Time (in theaters this Friday, October 28!) is a film I’m very much looking forward to seeing. Have been for a while. The more footage I see from it, the more I think this has the potential to be a really, really good movie. I absolutely love the concept of time replacing money and how in the future, you stop aging at 25 (it’ll be interesting to see how they explain that). I’m a huge fan of writer/director Andrew Niccol, for two big reasons; he wrote/directed 2005’s Lord of War, a highly underrated and underseen film that is some of Nicolas Cage‘s best work, but perhaps most of all because he wrote The Truman Show, one of my all-time favorite movies and one of the most original story ideas of the last 25 years (not to mention Jim Carrey‘s best performance).